I am English on my fathers [sic] side. His folks settled in Virginia shortly after the Revolutionary War and were English Quakers. I had been unable to trace her father’s side of the family back any further than the small bit of information I had about his name. I had no idea who his parents were, and I couldn’t really find them on the census. I’ve been on spring break, so I’ve had a little bit of time to conduct family history research, and on a hunch, I did some digging into her father’s family once again. Ancestry.com appears to have added quite a few databases I haven’t had the occasion to use, so it makes sense that this information was harder to find in the past. I don’t have the luxury of spending tons of money to order documents or hire researchers, never mind traveling all over the country to research in libraries. I tried using Ancestry.com’s search feature on my great-grandmother’s father, John E. Perkins. I had a match. After I did some digging around, I was certain I had the right person. His father declined to fight in the Civil War because he was a Quaker, and I found the family mentioned, finally, in Hector, Renville County, Minnesota, where I know my great-grandmother was born according to her own information. Unfortunately, the Perkins name had been misspelled “Perkis” on a census, but other evidence I found from books on the history of the area available online through Google Books confirmed it is Perkins and that I had at last broken down a brick wall. John E. Perkins’s father was John B. Perkins, and he was born in North Carolina, rather than Virginia, but that was fairly close and fairly typical of the ways family stories often are partly true. Actually, when I do some more digging, I may indeed discover the family came to Virginia first. 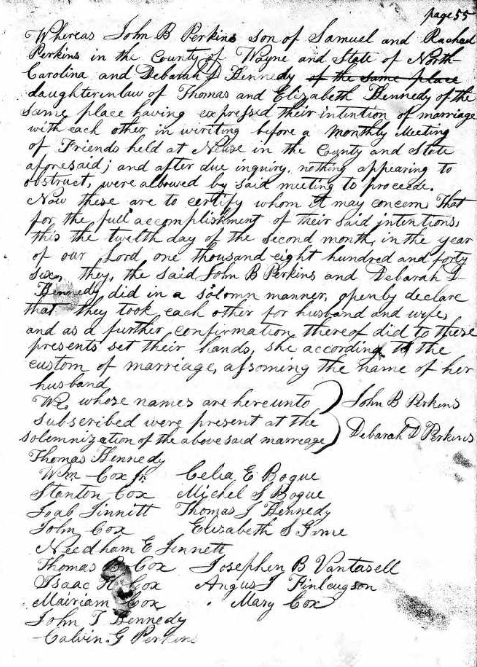 Tracing John B. Perkins back to North Carolina proved fairly easy because of the scrupulous records kept by the Quakers. Sure enough, the lead from my great-grandmother that her family were Quakers proved to be a solid one, and it helped me determine I had the right family. I am quite curious about John B. Perkins and his wife Deborah Outland. They had established a family in an old Quaker enclave in Wayne County, North Carolina. Based on the birthdates of their children, it’s possible to pinpoint their migration from North Carolina to Minnesota to 1852 or 1853. My ancestor, John E. Perkins is listed in census records as having been born in Minnesota in 1853, and his older brother William Samuel Perkins was born in Wayne County, North Carolina on 9 May 1852. What made John B. Perkins and Deborah Outland pull up stakes and go to the Minnesota Territory? They clearly came from a close-knit community, and there would be no guarantee they would be able to continue to worship in the manner to which they were accustomed. What was the lure? I discovered that John B. Perkins was something of a pioneer in the small town of Hector, Minnesota. He established a hotel there, and indeed, on the 1880 Census, he is listed as a hotel operator. The first school in Hector was taught in a room in the hotel above the kitchen, and the first church services were also held there. Reading about him in the various history books I could find online was absolutely like reading about characters from Little House on the Prairie. Towards the end of his life, he headed west again to California, where he died in Brentwood in Contra Costa County. I am fairly certain he is the same John B. Perkins listed on several California Voter Registers I found because his name and birthplace match up. What made him decide to go clear across the country for a second time, this time, just about as far as he could go? I found him absolutely fascinating. After I established the connection between John E. Perkins and his parents, using my great-grandmother’s clue to confirm what I had found, it was easy to fill in the rest going back fairly far. I have not yet input all of the information I’ve found to the family tree on this site, but look for it in the coming months. On a related note, I have done quite a lot of updating to the family tree. Places are now geocoded so that you should see a map keyed up to events in the lives of individuals. I have also added sources to many of the facts—a time-consuming process that will take quite a long time to complete. However, it’s important to me to include verification for information. I have not added information I’m not sure about. There are a lot of errors in trees, especially when they go fairly far back. I want the tree on this site to reflect research, with accurate and reliable information. I have done so many updates that it’s hard to list them all here, but in addition to adding sources, I have also added some portraits. Some of these portraits are from cousins on Ancestry. com, but Find a Grave has really exploded, and some users are quite generous in posting additional pictures they have of people on their Find a Grave memorials. A few years ago, it seemed I couldn’t find anyone, but now I can find most people in the last 200 years or so. My husband and I have also both registered with and submitted DNA tests to 23 and Me. We had done Ancestry.com’s DNA test as well, but we had also grown frustrated by some of the limitations of that kit. Given how large and comprehensive 23 and Me is, I expect I’ll be posting here about results. One other addition to the blog: I’ve made it easy for you to subscribe to updates via email. If you are family and don’t want to check for my sporadic (to put it generously) updates, please feel free to subscribe. The subscription area is in the sidebar to the right.